Posted by stuffilikenet in Awesome, Science. Usually the veins in bypass surgery come from the patient’s own leg veins, but sometimes that’s not an option. Synthetic vein grafts can be used but tend to develop clots more than do natural (donor) veins. University of Pittsburgh researchers have hit upon an interesting strategy for reducing clot formation by wrinkling the vein and then straightening it out again. Check out the bottom picture, there; it looks like an air-brushed playmate. 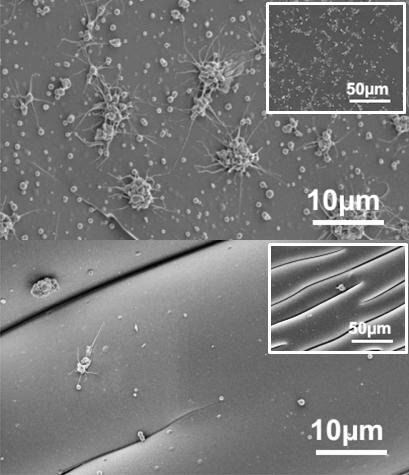 Top: A smooth surface after exposure to blood get fouled with platelets. Bottom: A surface that wrinkles while exposed to blood resists fouling. Posted by stuffilikenet in Awesome, Science, Star Trek Technology. Despite amazing improvements in understanding of diabetes, something like one in ten humans is Type II diabetic. Take a minute to absorb that; about half a billion people. Very, very obviously better medical tools and interventions are needed, since we as a species seem incapable of eating right (there are other factors, too; I don’t blame anyone for enjoying food). Researchers in the Netherlands and Canada have published a study using skin autofluorescence to detect some markers which accurately predict onset of Type II diabetes in the short term of about four years…unless they die first. It’s a good study; 72,000 patients. “After a median follow-up of 4 years (range 0.5–10 years), 1056 participants (1.4%) had developed type 2 diabetes, 1258 individuals (1.7%) were diagnosed with CVD, while 928 (1.3%) had died. Baseline skin autofluorescence was elevated in participants with incident type 2 diabetes and/or CVD [(myocardial infarction, coronary interventions, cerebrovascular accident, transient ischemic attack, intermittent claudication or vascular surgery)-ed.] and in those who had died (all p < 0.001), compared with individuals who survived and remained free of the two diseases. Skin autofluorescence predicted the development of type 2 diabetes, CVD and mortality, independent of several traditional risk factors, such as the metabolic syndrome, glucose and HbA1c.”. Without doing the rather more expensive bloodwork, a skin fluorescence gizmo could be made cheaply available. It’s an excellent first step. Posted by stuffilikenet in Toys, Uncategorizable. Posted by stuffilikenet in 3D Printing, Awesome, Brain, Science, Star Trek Technology. Scientists at Tel Aviv University have created human organs (little ones but, hey) from a bit of biopsied tissues. They separated the cells from the rest, induced pluripotency and built up organs in differentiated cell layers on a gel scaffolding. They were able to grow cardiac, spinal and cortical cells from the biopsy sample. This is critical to success: the cells are the patient’s own cells, with little chance of immune system rejection. These guys (Tal Dvir, Reuven Edri, NAdav Noor, Idan Gal, Dan Peer and Irit Gat Viks) are currently engaged in regenerating an injured spinal cord and an infarcted heart with spinal cord and cardiac implants. They have also begun to investigate the potential of human dopaminergic implants to treat Parkinson’s disease in animal models. They have big plans for this technology: “We believe that the technology of engineering fully personalized tissue implants of any type will allow us to regenerate any organ with a minimal risk of immune response,” Prof. Dvir concludes. Posted by stuffilikenet in Brilliant words, Geek Stuff, Science. "Where have all the bloody teaspoons gone?" is an age old question in the workplace. In an article in the BMJ [not concerned with scatology, but British Medicine] from 2005, researchers at the Burnet Institute in Australia attempt to measure the phenomenon of teaspoon loss and its effect on office life. They purchased and discreetly numbered 70 stainless steel teaspoons (54 of standard quality and 16 of higher quality). The teaspoons were placed in tearooms around the institute and were counted weekly over five months. After five months, staff were told about the research project and asked to complete a brief anonymous questionnaire about their attitudes towards and knowledge of teaspoons and teaspoon theft. During the study, 56 (80%) of the 70 teaspoons disappeared. The half life of the teaspoons was 81 days (that is, half had disappeared permanently after that time). The half life of teaspoons in communal tearooms (42 days) was significantly shorter than those in rooms linked to particular research groups (77 days). The rate of loss was not influenced by the teaspoons’ value and the overall incidence of teaspoon loss was 360.62 per 100 teaspoon years. At this rate, an estimated 250 teaspoons would need to be purchased annually to maintain a workable population of 70 teaspoons, say the authors. The questionnaire showed that most employees (73%) were dissatisfied with teaspoon coverage in the institute, suggesting that teaspoons are an essential part of office life. The rapid rate of teaspoon loss shows that their availability (and therefore office life) is under constant assault. One possible explanation for the phenomenon is resistentialism (the theory that inanimate objects have a natural aversion to humans), they write. This is supported by the fact that people have little or no control over teaspoon migration. Hilarious. But wait; there’s more. Exasperated by the disappearance, the scientists decided they would measure the phenomenon. Do the teaspoons really disappear over time? The answer was a resounding yes: spoons in research institute tearooms seem to have legs. While good fun, the research is a good example of a study design referred to as "longitudinal". A longitudinal study uses continuous or repeated measures to follow particular individuals – in this case, teaspoons – over prolonged periods of time. The studies are generally observational in nature: the scientists simply watch and collect data over time. Typically, no external influence is applied during the course of the study. Beyond just working out where all the teaspoons have gone, this study type is also useful for evaluating the relationship between risk factors and the development of disease (for example, heart disease), and the outcomes of treatments over different lengths of time. In this study, the main questions posed by our researchers were to determine the overall rate of loss of teaspoons, and to work out how long it took for teaspoons to go missing. They purchased 70 teaspoons (16 of which were of higher quality), each one discretely numbered and then distributed throughout the institute. Counts of the teaspoons were carried out weekly for two months, then fortnightly for a further three months. Desktops and other immediately visible surfaces were also scanned for "misplaced" spoons. After five months of covert research, the study was revealed to the institute, and staff were asked to return or anonymously report any marked teaspoons which may have found their way into desk draws or homes. conducted without external influences (teaspoon users/thieves were not aware they were being studied until the conclusion of the study itself). The results show that 56 (80%) of the 70 teaspoons disappeared during the study, and that the half life of the teaspoons was 81 days (that is, half had disappeared permanently after that time). 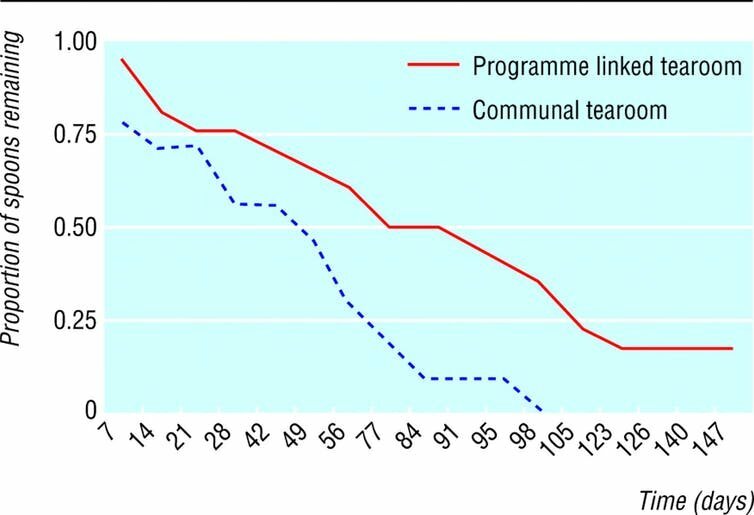 The study also showed the half life of teaspoons in communal tearooms (42 days) was significantly shorter than for those in research group specific tearooms (77 days). The rate of loss was not influenced by the teaspoons’ value. All of these pieces of information directly answer the main question posed by the researchers. A longitudinal study is terrific at following individuals or teaspoons over a period of time and observing outcomes. But, by definition, the design means there can be no intervention (as we are just observing a phenomenon). The researchers could not employ a tool or an intervention to prevent spoons from being "misplaced", and the researchers could only report a spoon missing. As the study is observational only, there is no way of finding out what has happened to the spoon, just that it is lost. The authors were able to conclude that the loss of workplace teaspoons was rapid, and their availability in the tearoom was constantly under threat. Posted by stuffilikenet in Applications, Geek Stuff, Publishing Tools, Video. I have been forced at gunpoint to use a Mac for the last six weeks at my newest place of employment, and not without a few tears. I had to learn to install IntelliJ, NetBeans and Eclipse (already had that one) for MacOS. The company which enslaves me uses MacOS’ Self Service app, from which I installed Homebrew. Homebrew does every installation you could possibly desire (well, nearly) and I installed in short order git, gradle, Java and IntelliJ–all correctly and findably by each other, managing the pathname (or whatever they are called in MacOS). I must say, this makes first-day setup for the engineers much quicker, and much simpler. Good thing too, since the poor sods are going to be working with a bewildering variety of the manifold technologies which enable the hydra-headed beast which is my employer. Chocolatey and Npackd, I quite liked Scoop (hence the Youtubery), but you may wish to try the others. Good luck; for your more complex setups this can be a real timesaver.